Fans of the show already know this, but I want to make sure you TV watchers got the heads up that the third season of Sullivan and Son is currently well underway, and airs Tuesday nights on TBS. Comedian Steve Byrne as Steve Sullivan, a successful corporate attorney who gives up his law career to take the reigns of the family business, a neighborhood bar known to its loyal patrons as Sullivan & Son. The show's cast also includes Jodi Long as Steve's tough Korean mother, Dan Lauria -- the dad from The Wonder Years! -- as Steve's Irish American father, and Vivian Bang as Steve's beleaguered sister Susan. While ABC's Fresh Off The Boat has gotten a lot of attention for being the first network sitcom to feature an Asian American family in twenty years, I've got to give props to Sullivan and Son for holding it down on cable for the last two years, featuring a different kind of Asian American family, front and center. The show can be crass and crude -- it's kind of like a dark and twisted Cheers -- and maybe not for everybody, but I really appreciate it for representing something different for Asian Americans on television and in comedy. The first two episodes of the new season are available for viewing right now on the TBS website. 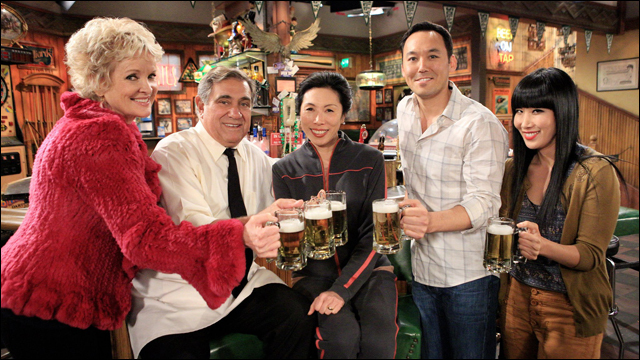 Sullivan and Son airs Tuesdays at 10/9c on TBS.